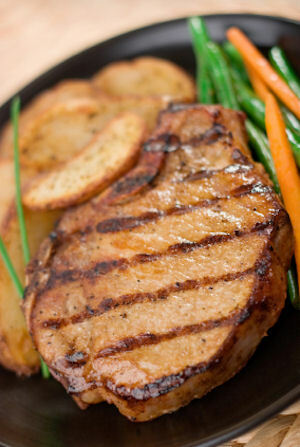 If you're looking for free recipes for pork chops, you've come to the right place! Here at PorkChopRecipes.net, we have put together a collection of some of the very best chop cooking ideas and have made them all available by simply clicking the links below. Enjoy! Cake - A selection of delicious cake recipes. Pancakes - Enjoy hot or cold, sweet or savoury. Trout - Methods of grilling, baking, smoking and frying this fish. Turkey - Great ideas for how to cook your bird, in the holiday season or otherwise. This elegant recipe takes pork chops to a new level of sophistication, with a rosemary-sage rub and a thick wine sauce to finish it off. Served with a glass of wine and side of Dijon potatoes, this dish is perfect or special occasions. Average rating 4.79 stars based on 28 reviews. Oven-frying is a great way to create a thick, crisp crust on your meats without all the fat. Battered in an egg-spice mixture, then breaded and baked, these chops develop a delicious savory coating similar to that of deep-frying. Average rating 4.12 stars based on 17 reviews. If you can’t escape to the islands, why not bring the islands to your table? Pineapples and pork chops are cooked together to create a fruity stewed dish that will make you feel like the vacation has come to you. Average rating 4.38 stars based on 13 reviews. While beer makes a good base for most stewed meats, it makes pork taste divine. Succulent braised onions and pork chops become slightly sweet and ever-so-soft from a simple beer broth, making this dish one to remember. Average rating 4.21 stars based on 14 reviews. Sometimes the most basic techniques are also the most flavorful. Such is the case with pan-fried pork chops --- with minimal seasonings, these chops get their flavor from a pan-sear that results in a sweet, brown crust. Average rating 5.00 stars based on 5 reviews. A corn crumb crust speckled with herbs and spices create flavor-packed pork chops with a heavenly baked texture. Average rating 4.00 stars based on 4 reviews. Creamy mushroom soup cook with sweetened, softened onions to make a savory sauce for pork chops. Serve this with your largest kitchen ladle -- the extra sauce will go fast. Average rating 4.17 stars based on 23 reviews. This recipe calls for a mustard crust similar to the classic lamb chops recipe served at Easter. Tangy and slightly sweet, this dish gains a lovely crust from roasting in the oven. Average rating 4.58 stars based on 12 reviews. A heart, comforting pork chop dish that will liven any winter night, this meat dish takes only minutes to prepare. Pork chops are browned, and simmered in a gravy of tender mushrooms and onions, zesty cumin, and creamy chicken broth. Topped with parsley for an added burst of flavor, this simple recipe will be an instant hit. Serve with a spinach salad and glass of white wine for a memorable meal. Average rating 5.00 stars based on 1 reviews. An oh-so-simple pork dish that makes a perfect dinner dish any night. Tender pork chops are browned,and simmered in a delicate balsamic vinegar glaze. Aromatic garlic and rosemary make this dish a savory and delicious addition to any meal. Average rating 4.50 stars based on 2 reviews.